St. Darerca of Ireland, and was one of St. Patrick’s sisters. There is not a lot known of her life, and much of it is obscure, but there is a network of legend, which medieval writers interwove her acts. He fame comes partly due to her relationship with Ireland’s national Apostle, but also stands secure as not only a great saint, but as the mother of many great saints. According to the “Tripartite Life of St. Patrick”, when St. Patrick visited Bredach, it is found that he ordained Aengus mac Ailill, the local chieftain of Moville, now a seaside resort for the citizens of Derry. While there he found the “three deacons” his sister’s sons, namely, St. Reat, St. Nenn, and St. Aedh. St. Darerca was at least twice married, and among her husbands according to histories in Brittany, she was the second wife of Conan Meriadoc. She was the mother of his eldest son Gradlon Mawr who became Gradlon the Great, King of Brittany. Darerca’s second husband, Chonas the Briton, founded the Church of Both-Chonais, now Binnion, Parish of Clonmany, in the barony of Ineshowen, Donegal. She had children by both husbands; some say seventeen sons, all of whom according to Colgan became Bishops. St. Patrick’s writings tell us that there were four sons of Darerca by Chonas, namely four Bishops. Darerca had two daughters, St. Eiche of Kilglas, and St. Lalloc of Senlis. Her first husband was Restitutus the Lombard, after whose death she married Chonas the Briton. By Restitutus, she was the mother of St. Sechnall, St. Nectan, Sts. Fennor, St. Auxilius, St. Diarmaid, St. Dabonna, Mogornon, Drioc, Lugauat, and Coemed Maccu Baird. Old Irish writers, assign her four other sons namely St. Crummin, St. Miduu, St. Carantoc and St. Macceaith. It is believed that St. Darerca died a natural death and is honored on March 22nd. She is the patroness of Valentia Island. 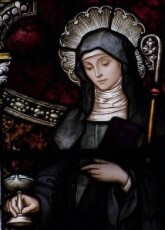 St. Darerca of Ireland, and was one of St. Patrick’s sisters. There is not a lot known of her life, and much of it is obscure, but there is a network of legend, which medieval writers interwove her acts. Her fame comes partly due to her relationship with Ireland’s national Apostle – St. Patrick, but also stands secure as not only a great saint, but as the mother of many great saints. She is said to have all of her seventeen sons that became Bishop’s. Many of her daughters are early saints of the Church as well. Her life shows us that as good parents, teaching the faith, the faith can be instilled into their children, which not only serve the Church, but also become great saints.